The stage at DPAC is going to take a pounding next week….literally, when it will be home to the amazing tap skills of the Tap Dogs crew when they bring their high energy tap show to the Bull City next Tuesday, March 19th and Wednesday, March 20th. This performance serves up an intermission free 85-minute high-intensity show filled from end to end with precision tap dancing moves and heart pounding rhythms and music. The performance is part dance and part rock concert with dancers showing off their skills on a set that resembles a construction site. The setting lends itself well to different surfaces and building materials like metal girders and moving platforms the dancers can manipulate for amazing stunts and tap routines. The set also includes a large digital screen background with a colorful light production blended into the performance making for an exciting backdrop to the dancers. The popularity of Tap dogs has helped propel the popularity of tap in the United States and around the world and helped shaped the world of modern tap and features an amazing internal cast of dancers and musicians. It’s a small but tight cast with 6 guys tapping rounded out with two extremely talented female musicians adding a high-energy beat to accompany the tap moves. Nathanial Hancock is one of the six talented tap dancers currently touring with the production and adding to the fancy footwork delighting fans all over the world. He has performed with Tap Dogs throughout Europe, Asia, Bahrain, UAE, Australia, and South Africa over the past 7 years. Nathanial’s love of rhythm and unique, intricate time signatures place him at the forefront of modern tap dance in Australia. He has toured with the production for the past seven years and when he is not touring he is teaching tap in his home country of Australia. I spoke Nathaniel last week by phone to learn a little more about his journey to the stage and what the audience can expect from the show at DPAC. When did you first know you wanted to be a tap dancer? I pretty much knew I wanted to dance since I was a little kid. My first exposure was seeing Gene Kelly tap in the movie “Singin’ in the Rain” when I was around 6 years old. Then I saw tap dogs in Brisbane when I was just 11 years old and I knew tap is what I wanted to do! What can Audiences expect at the show? This is a high-intensity high energy show filled with amazing tap footwork all choreographed beautifully with music performed live on stage. There is no dialogue, just dancing and music. It’s very much like a rock concert, but with the rhythm and intensity of tap! Well Tap Dogs has been touring for almost 23 years. I’ve been with the Production for 7 years now. We added the two female musicians in recent years and modified the sets. There has also been the addition of an amazing light and digital screens to adding to the overall visual experience to attending the show. It’s a family-friendly show that is accessible for everyone regardless of your experience with tap. There is dancing, music which really offers something for everyone to enjoy. Most if all, because there is no dialogue there is not language barrier so everyone all over the world can enjoy the performance as it speaks through the universal language of dance. Boxyard RTP Coming in 2020! Cool announcement out of from Research Triangle Park today. Boxyard RTP, a 15,000-square-foot cargotecture development, will be coming to the Frontier RTP campus (Highway 54 near T.W. Alexander Drive) in 2020. Plans for Boxyard RTP include space for up to nine food and beverage vendors, as well as several retailers and service providers. The site will be designed to support retail and dining entrepreneurship in the Triangle. Food and beverage container spaces will come with partial kitchen equipment upfits, enabling smaller businesses to focus on preparing food rather thanexpensive overhead. The unique development will also be home to a rich program of events, providing social, educational and health-oriented opportunities to patrons. Covered spaces for seating, special events and performances will be located throughout Boxyard RTP, creating an indoor/outdoor shopping and dining experience to enjoy year round. The complex will be people and dog-friendly, and is adjacent to an existing public dog park on the Frontier RTP campus. For more information check out https://boxyard.rtp.org/ and follow them on instagram at @boxyardrtp. 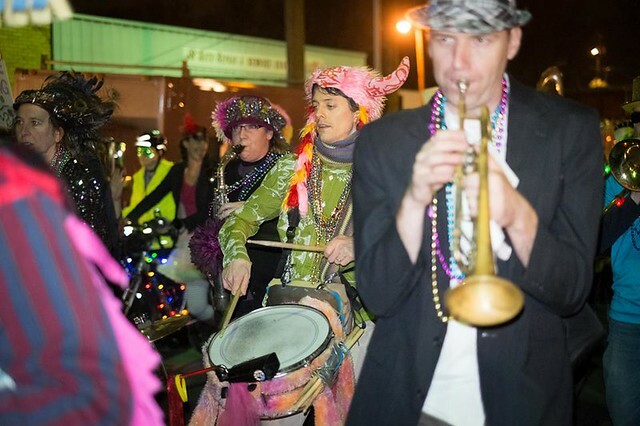 Durham Mardi Gras Celebration this Tuesday! Durham Mardi Gras is one of my favorite local events! This Tuesday night you can catch New Orleans inspired music and festivities on 5 stages in the Bull City (all within walking distance of each other). Best of all it is all FREE and open to everyone. Check out the full music schedule below and laissez les bon temps rouler! Five Places to Celebrate National Margarita Day! I love a good margarita! While it is a little funny that “National Margarita Day” is celebrated in the dead of winter it is a welcome escape and a friendly reminder of the warm spring and summer weather that is just around the corner. Here are my top five picks (in no particular order) of great places to celebrate with a delicious cocktail this Friday. With five locations across the Triangle Gonza Tacos y Tequila is the perfect spot to meet with friends and celebrate the end of a busy the work week. This Friday each location will feature their tasty grapefruit/rosemary margarita alongside their classic cocktail offerings. Bartaco has two locations in the Triangle – one in Chapel Hill at University Place Mall and another located in North Hills in Raleigh. They offer a great classic margarita made with fresh squeezed lime juice. The tacos are delicious too! Gallo Pelon has a wonderful cocktail menu and what I think is probably one of the best beverage programs in downtown Raleigh. This is the place to go for a simple yet sophisticated margarita this weekend. Switching gears here for a moment, the drinks at NanaTaco in Durham are high on my list for somebody looking to celebrate national margarita day on a budget. Nana’s has some great food but most importantly they offer $5 Margaritas every day! A burger bar may not be the first place that comes to mind when looking for places to enjoy a Margarita, but Bad Daddy’s Burger is a hidden gem with great drink specials at the Morrisville, downtown Raleigh and North Raleigh locations. They have a solid house margarita on the menu and best of all it is the featured $5 drink special each Friday! Countdown 'til #NationalMargaritaDay starts…. NOW. Are you ready? Family Fun with Charlie and the Chocolate Factory at DPAC! If you are like me, your introduction to “Charlie and the Chocolate Factory” was seeing the 1971 film starring Gene Wilder. This was also most likely my first introduction to dark humor. I’ve never read the original book by Roald Dahl’s or seen the more recent Tim Burton film adaptation so I don’t know how they compare. My expectations going into the show at DPAC this past Tuesday night were squarely based on the original film. I think this production does a fine job telling the crazy story of Willy Wonka and his plan to find a heir to take over his beloved chocolate factory. It’s still a mixture of imagination and wonder with a dash or two of old fashioned dark human nature. As you might expect, his story proves a bit challenging to portray on stage as a family musical, but in the end this production, directed by Jack O’Brien, does the story justice while keeping it suitable for the whole family. Understudy Benjamin Howes did a wonderful job playing the lead role on opening night. Wonka is a complicated character when you really think about it. He is the mysterious maker of the chocolate everyone loves, but he isn’t really what you would call a “nice guy”. In fact he is more concerned about the quality of his chocolate than the well being of the kids touring his factory. But Howes, pulled off the character exceptionally well, and his vocals were always on point. Charlie Bucket was played by Rueby Wood on Tusesday night. His portrayal of Charlie brought a kindness and optimism that was refreshing to see in a character that is usually portrayed more downtrodden due to his life of poverty. Having adults portray the other children who score golden tickets was an interesting twist, but one that works well as they provide a stark contrast to the innocence of charlie. And ultimately when you see Augustus Gloop, Veruca Salt, Violet Beauregarde and Mike Teavee come to their dark demise, you don’t feel quite as bad, because well they are actually adults…not kids. This fun and modern version of the story provides a wonderful escape. From the catchy tunes you love from the the original film, to the creative sets and portrayal of the Wonka Factory. The famous Oompa Loompas are quite a treat as well, but I will not give too much away about them as they add to the the magic of the production. Ultimately while this show has it dark humored moments, Charlie leaves us all with an inspiring message. No matter where you come from, or what obstacles you face, don’t be afraid to dream big!